Putting together a panel discussion can be time consuming and stressful. It’s important to get the right opportunity, a good idea that will appeal to an audience, and, or course the right people to sit on the panel. All these elements have to come together for success. And when it works, it’s hugely satisfying. Our experience on industry outreach with our client AVIXA is a case in point. agements in Europe in their key vertical markets; education, transport, stadia and arenas, as well as retail where some of the most exciting audiovisual work is being done. RDSE is lively, well attended event dedicated to the digital signage industry. In common with most tradeshows there is a comprehensive conference programme that runs alongside the main event which adds value for delegates taking time to out of the office to make the trip to Olympia. 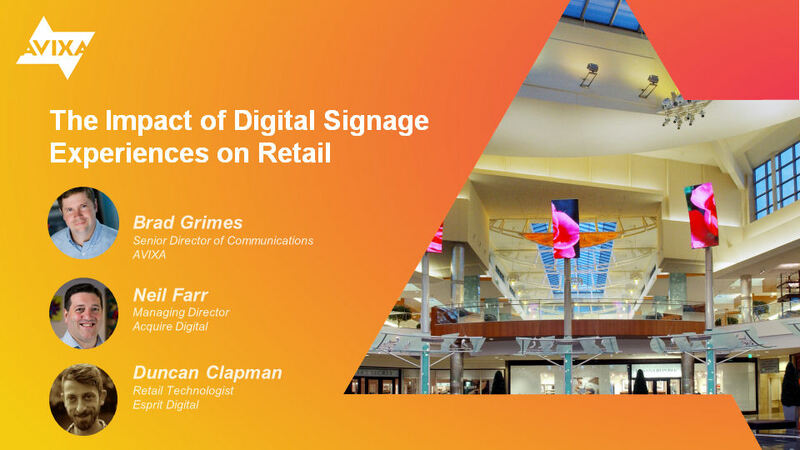 AVIXA hosted a session on the first morning: the impact of digital signage experiences on retail. On the panel were Neil Farr, managing director of Acquire Digital and Duncan Clapman, a retail technologist at Esprit Digital. Moderating the discussion was Brad Grimes, senior director of communications at AVIXA. A lively forty five minute session ensued and gratifyingly, from all points of view, was that there wasn’t a spare seat to be had. After all the hard work it was great to see an engaged audience enjoying and participating something in that we’d been planning for a couple of months. If you’re an exhibition organiser who wants to work with a company that gets things done and delivers brilliant results, or a manufacturer that wants to maximise exposure at tradeshows, or anywhere across the media landscape, click here to get in touch.